You're passionate about the law and helping those in need. Regent's Bachelor of Science in Paralegal Studies will equip you with research, communication, organization and technology skills needed to pursue a meaningful career in the law field. Gain an overview of the most common practice areas of law, including marriage and family, real estate, personal injury and contracts—all from a Christian worldview. Grow your research and writing skills, legal terminology, and clerical and management skills. Christian and historical foundations as the basis of American jurisprudence. 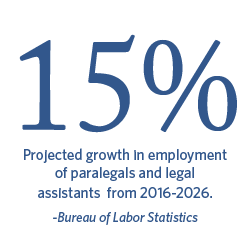 Paralegals' role in the law office. Survey of U.S. law; importance of research, legal writing and ethics. Analysis of the case law and statutory law systems. Writing of legal memoranda. Utilization of online law libraries, and other resources and tools. Create a complaint to initiate a lawsuit. Basic legal principles with ethical approaches to investigations. Utilization of federal, state and local regulations governing rules of evidence. Interviewing techniques and investigation plans. Sourcing of witnesses and rules governing admissibility in court. Clerical and management skills of law firms; fee arrangements, time tracking, billing, basic accounting, handling client funds, and records management; etiquette, and marketing. Litigation protocols in organization of law offices, time management, fact investigation, flow of litigation, court systems, commencement and defense of lawsuits, discovery, evidence, motions practices, and trial preparation. Settlement and post-trial practices. Comprehensive, including marriage, divorce, annulment, division of property, child custody and support, spousal support and adoption. Preparation and filing of requisite documents/pleadings. Bodily injury/property damage and requirements for tort liability and compensation; worker’s compensation systems. Practical aspects of PI practice from plaintiff’s and defense perspectives. Law of formation, legal construction, execution, and enforcement of and remedies under contracts. Drafting real estate contracts, deeds, mortgage instruments, foreclosure notices, mechanic's liens, leases and listing contracts. Legal concepts of real estate documents related to estates in land, homestead, fixtures and easements. Title searches and closings. Immigrant/non-immigrant visa categories and requirements. Form utilization (family-based petition, worker-based petition). Gaining lawful entry into the United States; deportation and removal requirements. Developing understanding of trademarks, copyrights, patents, and trade secrets, and ownership thereof. Concepts and components of estate planning and probate law firm practices. Form filings, probate accounting and processes. Roles of fiduciaries in regards to wills, trusts, and probate processes.